Here's something you may not know about me....I'm not a big fan of mashed potatoes. I want to like them; but there's just something about mashed potatoes that has never really appealed to me. 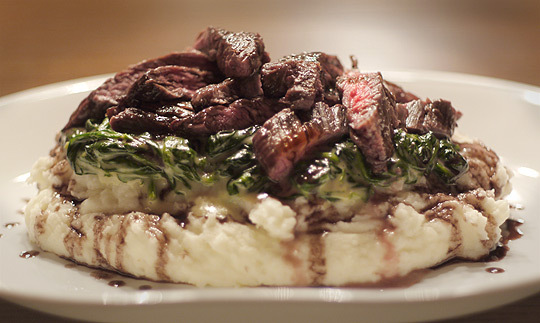 Until recently, when I gave horseradish mashed potatoes a try, and fell head over heels for them. I think it's the kick from the horseradish that did it...I like the kick. Most potatoes pair well with beef and these are no exception. I like buying my meat from Whole Foods Market because the cattle they use are never given any growth hormones or antibiotics. Not only is this better for health reasons but I think it makes for a much tastier piece of beef. See below for details on how you can win a Whole Foods Market gift card to check out their meat for yourself. In a saucepan, heat the oil over medium heat. Add in the carrot, celery, onion, and garlic. Cook for 15 minutes, stirring occasionally. Add the wine and cook down until almost all is gone. This will take about 20 minutes. Add in the stock, thyme, bay leaf, and peppercorns. Bring to a boil, then reduce the heat down so that it’s simmering. Cook it for about an hour, until it’s thick enough to coat the back of a spoon. Turn off the heat. Place a fine-mesh strainer on top another sauce pan and pour the mixture into the strainer. Mash the vegetables up with the back of a spoon. Put the potatoes in a large pot and cover with cold water and some salt. Bring to a boil, lower heat and simmer for about 12 mins until potatoes are fork tender. Add butter, cream, and milk in a small sauce pan and cook over medium-low heat. Drain the potatoes. Pass them through a ricer if you have one and into a bowl that you can eventually place over hot water on the stove (metal or ceramic will work). If you don’t have a ricer, get out the mixer. Slowly add the warm butter/cream/milk into the potatoes. Stir happily but not aggressively. Slap in the creme fraiche and horseradish. Stir lightly. Salt and pepper until you’re pleased with yourself. Get out another saucepan (the one that you cooked the bordelaise in will work here, even if you don’t want to clean it). Add in a couple of inches of water. Place it over the heat to simmer, placing the mashed potato bowl on top to keep them warm. Melt 1 tablespoon of butter in a large saute pan, over medium heat. Add the shallot. Stir until they become soft and translucent, 2 or 3 minutes. Turn the heat up to high and add the spinach. Stir and cook for 3 minutes. Drain spinach into a colander, set it over a bowl, and let it stand for 10 minutes. In a small pot add milk and heavy cream. Bring to a simmer. Lower the heat and keep it warm. Melt the remaining tablespoon of butter over medium heat. Add the flour. Whisk it for about 4 minutes. In a slow stream, whisk in the warm milk & cream. Keep whisking for about one minute until it’s thickened. Add in salt, cayenne, and nutmeg according to taste. Add in the spinach. Stir. In a cast iron skillet, over high heat, cook for about 10 minutes total, flipping once. Let the steak rest for 5 minutes. Slicing against the grain, cut the meat in ½-inch-thick pieces. Reheat the bordelaise over low heat while you plate everything else. Place a serving of potatoes on your plate. Add some creamed spinach on top. Then some steak slices. Drizzle with bordelaise. My favorite veggie for sandwiches is tomato! I like adding fresh cucumbers! I love tomatoes and lots of other veggies. Roasted eggplant or roasted peppers. I love avocados on my sandwich! I love lots of crunchy veggies! After exploring a number of the blog posts on your blog, I seriously appreciate your way of writing a blog. remarkable post and a all round thrilling blog (I also love the theme/design), I don't have time to go through it all at the minute but I have bookmarked it and also added in your RSS feeds, so when I have time I will be back to read a great deal more, Please do keep up the awesome work.